The SH903 is fitted with a third action catch for increased safety--commonly known as "triple action" or "triple-locking". 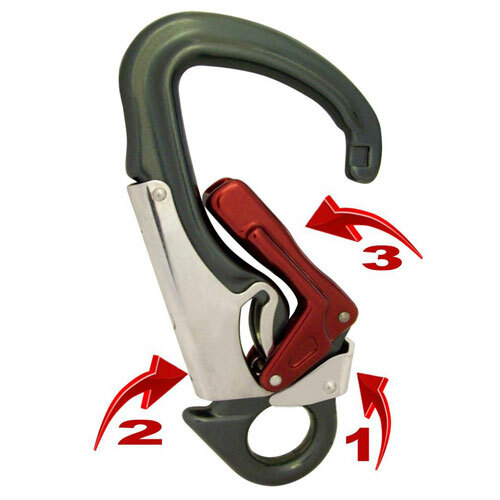 This hook is ideally suited to climbing activities where triple-locking connectors are required (e.g., adjustable lanyards and fliplines). The "Safety Heel" further reduces the risk of accidental opening and the "Blind" nose helps to prevent rope snagging. Nearly identical in design and construction to the benchmark Kong Tango, the SH903 has several interesting features. The base near the eye protrudes, protecting the opening mechanism from contact when being dragged. There is also a unique triple-lock that makes accidental opening nearly impossible. We rate the ease of clipping about equal to that of the Wichard Proline. It is slightly easier to open bare handed, but significantly more difficult with heavy gloves. One tester with weaker hands struggled to make it work. As with the Proline, we've only had this clip in the field for a matter of weeks, but based on the accelerated corrosion testing, we expect it will be as durable as the Kong Tango. 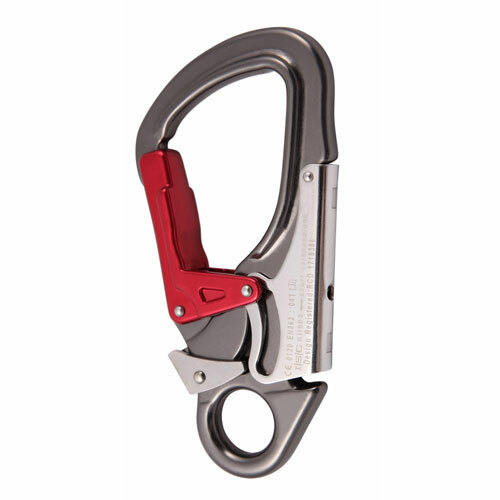 ISC also makes a very similar very fast single-acting carabiner, like the Kong Tango (SH 901). They are not certified under ISO 12401 but would likely meet the requirements. Bottom line: This is a very secure carabiner. The only thing holding it back is lack of an ISO 12401 certification, which it would almost certainly pass.